There is nothing to beat a fresh hopper straight out of the pan… unless it is a steady stream of fresh hoppers coming to your table at Elephant Corridor, straight from the pan! 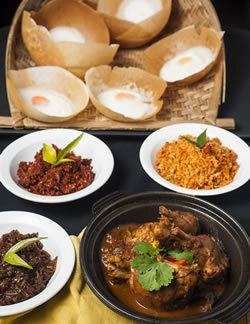 Hoppers are a Sri Lankan specialty – and a popular choice at Elephant Corridor. Starting out as a batter made from rice flour, coconut milk, palm toddy, and a blend of spices, they are cooked into a crepe-thin, bowl-shaped pancake in a hot pan over a gas range. Hoppers can be made plain, or with an egg cooked into the middle (egg hoppers), or with a sweet centre (pani appa), as two of the most popular kinds. Our chefs are skilled in the tricky art of knowing just how long to cook the hoppers so they are golden on the outside, and pale on the inside – crunchy around the edges, and smooth and soft on the inside. At Elephant Corridor, we serve our hoppers fresh from the pan, and recommend a selection of our delicious curries to eat with it. Of course, no meal with hoppers would be complete without a serving of luni miris (crushed red onion and chilli) on the side! The combination of tastes and textures is sure to keep you coming back for more! Hopper catering at your home. Are you looking for Hopper catering for your party? We have mobile catering avaialble.